I am a part time SAHM/part time Substitute Teacher. I have lived in Arkansas all of my life. I have two children, 1 boy (6) and 1 girl (12). I been have married to my wonderful hubby for almost 19 years now. I started crocheting in 2007 after I lost my mom because of a car accident. but I was never really interested in it. All I could do then was chain. Then after losing her I felt like I needed to do something to ease some of the pain. I decided since crocheting was something she always wanted me to do I would try it again. I went to the store and bought one of those I taught myself to crochet kits and the rest is history. So I have to say thanks mom. After I started crocheting, one of the first things I started making was prayer shawls. I have made them for cancer patients and some have been given away or auctioned off for charity. I love to crochet more for others than I do for myself. I also enjoy all kinds of crafts. I do a little bit of cross stitch and knitting on the side as well. Daisies are my favourite flower and were also my great grandmothers favourite. My Etsy store is Mel’s Daisy Patch, and I always feel like I am being lazy when I crochet. I originally started out as a book review blogger in March of 2010, with a blog called melsdaisypatch.blogspot.com. I do book reviews for some of the Christian book companies in exchange for free books. 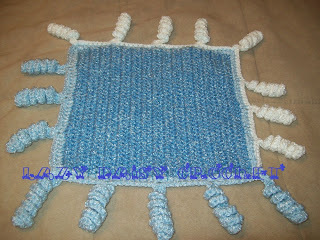 Then in June of 2011, I started my crochet blog lazydaisycrochet.blogspot.com. so I started my own crochet blog to keep up with what I was doing and making. In September of 2011, I started another blog lazydaisycrossstich.blogspot.com. I haven’t done a whole lot with it though. They love for me to make things for them. and because of that I have started making my own patterns. I always wanted to but never thought I was good enough to do it. Then I started crocheting some baby goodies for some of my son’s teachers. My son decided he wanted a snuggle blanket that looked like a puppy. I couldn’t find a pattern, so that’s when I decided I would try it on my own. I am very proud of the way it turned out and he loved it. sit and watch movies or fun shows with my kids, and just hang out with my family. On Mondays I spend the day at my son’s school helping out and eating lunch with him. My newest pattern I came up with. I had a dream one night about a baby that had the cutest blanket. 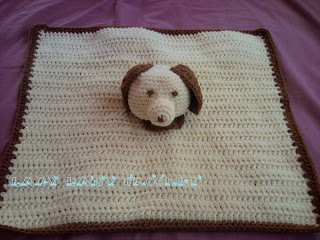 It was, what I would call, the crochet version of a taggies blanket. I woke up the next morning and drew a picture of it. I have lovingly named it my Wiggles and Giggles Baby Blanket. The original one that I made was given away as a baby gift. The sweet mamma loved it so much. She said she couldn’t wait to have her baby so that he could play with and hold it. I have some other versions of it in the works. I can’t wait for everyone to see them. I have to say a big thanks to my mother in law (whom I call mom) who came up with the idea. I started selling things in my Etsy store in 2008. I also have a store on shophandmade.com. I was a SAHM who wanted to make a little extra money at that time. I only sold a few things back then and gave up for a while. I decided maybe I should try again. I’ve sold a few of my cross stitch patterns and hope to start selling some of the crochet ones soon also. I have two favourites right now. My Snuggle Puppy Pattern and my Wiggles and Giggles Pattern. I am so proud of the way they turned out. I love to get pictures from my testers and others who have done my patterns. The advice I would give a new blogger is just put yourself on your blog. Talk about and show the things you love to do and are doing. Don’t worry about if anyone is following you or not. For a person setting up their own craft shop, I would have to say be patient! It can be tough sometimes. But if you think you have something that will sell try to sell it. and you can always relist it if it does sell. Take lots of well lit pictures and have fun with them . As of yet I do not use Facebook. please pop over and see Melissa's other patterns. Thanks ever so much Melissa! You are more than welcome, big cyper hugs back :-)! I love the blanket, now following you both. Have a great weekend. So glad you like it. 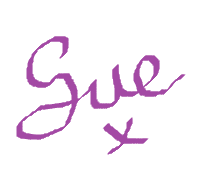 I hope you enjoy both our blogs!